Having trouble finding a third or fourth player to get a game started? You can now fill in the remaining positions with robot players. All you have to do is check 'yes' for the robot player option when you are waiting for other players to join a game. I all the other online players who are waiting for the game to start have this option checked the empty spots will be filled in with robot players and the game will automatically start. There is another new feature which allows you to join a game at any position. So if you want to play with a friend as their partner you are now able to do that. Player 1 is partnered with player 3 and player 2 is partnered with player 4. The Wahoo Multi-Player game is brand new. Help build the network of players by inviting your friends to register. Don't have a player profile? Register here. A verification email will be sent to the email address you provide. Click the link in the email to verify and activate your player profile. Just click “Roll” (in most browsers you can just hit the spacebar). The red and green players are partners and the white and black players are partners. The “Roll” button appears automatically when it is your turn and you have to roll your dice. The program will tell you when you have no valid moves and if you only have one possible move, it will be made automatically. If you have more than one valid move you must select which marble you want to move. If the marble can make a valid move it will have a yellow halo around it, otherwise the marble can't be moved. Once you click the marble it will be automatically moved. The program will prompt you if a move involves entering or exiting the shortcut hole. 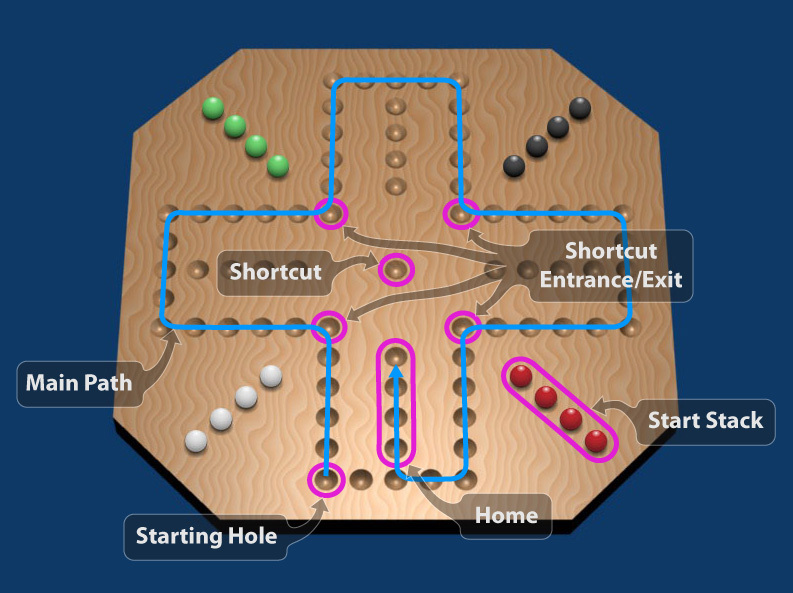 You must roll a six or a one to bring a marble from the start stack to the starting hole and you must roll a one to enter or exit a shortcut. Using the “Options” menu you can quit your current game and start a brand new game or you can adjust the game speed. 1. The object of Wahoo is to get all 4 of your marbles into your home area. This version of the game is played with teams. Your team partner is on the opposite side of the board. For your team to win both you and your partner must get all 4 of your marbles in the home area before the other team. When one team member has all his marbles in the home area he continues to roll on his turn but his partner must use the amount shown on the dice to move one of his marbles if he has a valid move. 2. To get one of your marbles from the start stack into the starting hole of your main path you must roll a six or a one and your starting hole cannot be occupied by one of your own marbles. You can have as many marbles on the main path as you like. Once you are on the main path you can move any one of your marbles the number of holes shown on the dice if the move is valid. If you only have one valid move you must make that move. If you have no valid moves you can't move any marbles. Normally you roll once per turn with the next turn going to the player on your left. If you roll a six you can move then roll again. Even if you can't use the six for a valid move you still roll again. 3. You cannot jump or land in a hole occupied by one of your own marbles. This rule also applies to your marbles in the home area. If the roll of your dice would take you past the last hole of your home area, then the move is not valid. If you land in a hole occupied by an opponent or your partner you must remove their marble and place it in their start stack. this action is referred to as "kicking". Marbles in the home area cannot be kicked. 4. To enter the shortcut hole your marble must enter from a shortcut entrance and you must roll a one. To exit the shortcut hole you must also roll a one. You can use any shortcut exit as long as it is not occupied by one of your own marbles. Just remember, Wahoo is a game that can drive you crazy very quickly. So good luck!! and roll those sixes! Welcome to version 1.0 of Multi-Player Wahoo. Feel free to report any bugs or problems. Version 1.0.1 - fixed move arrow and kick highlight bug. Version 1.0.2 - improved move highlight function and message display.